We want everyone to have as much fun with the Storyboard Creator as we do! Check out the wide array of storyboard tips, tricks, and ideas you can use in your classroom. One of the best parts about using computers and tablets in school is the expansion of accessibility for students who need extra help. Between settings built into the device and applications that can be installed, the experience is easily tailored for individual students, allowing them to achieve their full potential in the classroom. Chrome Extensions are a perfect way to enhance their experiences on the web and help reduce frustration. When students are learning a new language or need help understanding what they're reading, extensions that help language comprehension are incredibly important. They can be used to supplement and introduce new vocabulary or let students hear words out loud. Language and reading comprehension is an important part of any project or assignment, and reducing the frustration that might come along with it will help students gain confidence and make huge strides in their education. While Chrome does have a built-in spell check, spelling isn't the only thing that students are learning and practicing, especially when they're online. They might be reinforcing new vocabulary with storyboards or working on their grammar. It helps to have an easy way to look up words, find synonyms and antonyms, and check sentence structure. Extensions that fall into this category work well for native English speakers, as well as ESL students! They're great for aiding students along the way because they reinforce correct grammar. App smashing allows students to create projects using multiple applications (shortened to "apps") to achieve the end result. The applications can be anything from the camera app on a phone to a website like Storyboard That. Providing a variety of different apps to use lets students pick the ones that allow them to achieve their desired outcome. Each part of the project is completed in a different app and the result is an integrated presentation. Combining applications with Storyboard That enhances storytelling through the addition of photographs, audio, and video. Storyboard That allows you to create worksheets and other full page documents using the features available in the Storyboard Creator! We recommend you start with a template for structure, but sometimes a completely blank page is all you need! A good knowledge of lab safety is essential for our students to carry out practical work in the laboratory. Students love doing it and have the ability to learn a great deal, but safety has to come first. It is an effective way to teach the principle of scientific inquiry, develop student skills in measurement and observation, and to motivate and engage students. A good first step is making sure that any practical activities are properly and thoroughly risk-assessed by the educator before the activity takes place. Educators should do the experiment or demonstration first before the lesson to understand any risks. Make this year more effective by enhancing students' comfort level in your class. Health education covers various topics that, to most, may be a difficult topic to talk about. Personally, this is the reason I enjoy this subject so much. It’s the teacher’s role to create a classroom environment to invoke and support discussion of difficult topics. Comfort and safety is not only important for students to feel around their peers, but to feel with their teacher as well. A health education teacher is a potential resource for students, providing comfort for any students reaching out. Students may challenge themselves in your classroom if they feel it's a safe place. With the many possibilities of Storyboard That, French teachers will enjoy using the platform as much as their students! 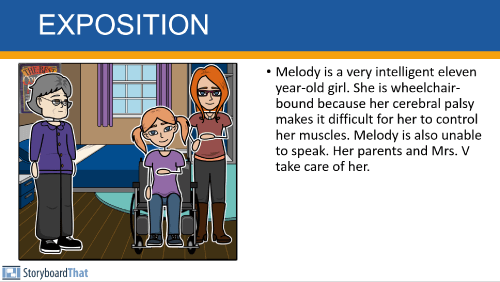 Not only can the storyboards be used for student activities, but they can also serve as a resource for creating materials for the language classroom. From worksheets, to tests, to oral language practice, teachers can use the artistic software of Storyboard That to personalize and adapt printed assignments to the needs of their particular students. It is important we don’t view our students as empty vessels or blank slates when they come into our classrooms. Students are full of their own ideas and theories about the world, some of these are correct and some of them are incorrect that don’t agree with current evidence and agreed thinking in a subject. Often as educators we can fail to appreciate the wide and varied experiences our students have had and the effect this can have on how they think the universe works. Students have misconceptions in all subjects, but this is especially true in science. Storyboard That has a lot of great ideas for student activities and for teaching topics. We want to make it easy for you to access these resources, but also understand that what we have provided may not be exactly what you are looking for. The Copy Assignment feature gives you an excellent starting point for student activities! First Then Boards are a visual support system that allows young children or children with language delays to understand routines, expectations, and reward systems in more accessible ways. By providing a visual support along with language and social interaction, students are able to participate more independently and with less frustration in everyday activities. The simple layout of two spaces allows for the caregiver to update the board frequently and adjust depending on the student’s needs. Often a binder or pocket folder with Velcro to hold many cards makes the system compact and usable throughout the routine. We give and get instructions all of the time. Whether it is a tutorial on a website, a recipe for dinner, or directions to the post office, instructions are all around us. We go through various processes too, as do many natural phenomena. Life cycles, routines, photosynthesis, digestion - processes are everywhere! Instructions and processes are so much more easily understood when accompanied by visuals. When we storyboard a process or create a sequential diagram, we can focus on discrete steps, cause and effect, and sequence. Teachers today have to take into account so many different factors that go into preparing a lesson, because our student population is rapidly changing. Kids are no longer “tracked” in the traditional sense; instead, most of our classes have students with all kinds of learning abilities, including those who may need a little extra help accessing the curriculum. As a high school English teacher in a vocational technical school, I see firsthand the benefits that visual learning and hands-on assignments have on my students. When my kids use Storyboard That, I see huge jumps in their ability to retain information, their engagement and enthusiasm, and their confidence. Good grief! Can you believe it is BTS time already? The summer always flies by, but don't worry: the team of teachers at Storyboard That has come up with some great ideas to get storyboarding with your students right away. Let’s take a brief look at the export options you have for your public storyboards! When viewing your storyboard, you will see several buttons below the storyboard. These buttons allow you to go back and edit your storyboard, view as a slide show live in the browser, or export your storyboard in different ways. Everyone at SBT wants to bring out your creativity, improve your visual communication, and hear your story! Some people prefer our timeline layout to show ordered events with dates and descriptions, focusing on the visual aspect of the sequence of events or steps in a process.